The revelation of God, one and three. “The central mystery of the faith and of Christian life is the mystery of the Most Holy Trinity. Christians are baptized in the name of the Father and of the Son and of the Holy Spirit” (Compendium of the Catechism of the Catholic Church , 44). Jesus’ entire life is a revelation of God, one and three. At the Annunciation and the Nativity, when he is found in the Temple at the age of twelve, in his death and resurrection, Jesus reveals himself as Son of God in a new way with respect to the filiation known by Israel. In addition, at the beginning of his public life, at his Baptism, the Father himself testifies to the world that Christ is his beloved Son (cf. Mt 3:13-17 and parallels), and the Spirit descends upon Him in the form of a dove. This first explicit revelation of the Trinity is paralleled by the scene of the Transfiguration, which introduces the Paschal mystery (cf. Mt 17:1-5 and parallels). Finally, when departing from his disciples, Jesus sends them to baptize in the name of the three divine Persons, so that the whole world may come to share in the eternal life of the Father, the Son, and the Holy Spirit (cf. Mt 28:19). In the Old Testament, God had revealed his oneness and his love for the chosen people: Yahweh was like a Father. But after having spoken many times through the prophets, God spoke through his Son (cf. Heb 1:1-2), revealing that Yahweh was not only like a Father but is the Father (cf. Compendium, 46). In his prayer, Jesus calls him Abba, an Aramaic term Israelite children used in addressing their own fathers (cf. Mic 14:36), and He always distinguishes his own filiation from that of his disciples. This is so astonishing that it might be said that the real cause of Christ’s crucifixion was his calling himself the only Son of God in the strict sense. This is a definitive and immediate revelation,  for God is revealed by his Word; we cannot expect a further revelation since Christ himself is God (cf. Jn 20:17) who gives himself for us, bringing us the life that dwells in his Father. In Christ, God opens his intimate life to us, which would otherwise be inaccessible if we had to rely on our own powers. This very revelation is an act of love, for the personal God of the Old Testament freely opens his heart, and the Only-begotten of the Father comes to meet us, to make Himself one with us and lead us back to the Father (cf. Jn 1:18). Philosophy was unable to grasp this truth, since only the light of faith can make it known. In fact, the revealed names of three divine Persons require us to think of God as an eternal procession of the Son from the Father, and the mutual relation, also eternal, of Love that “proceeds from the Father” ( Jn 15:26) and the Son (cf. Jn 16:14)—the Holy Spirit. Thus, revelation tells us of two processions in God: the generation of the Word (cf. Jn 17:6) and the spiration of the Holy Spirit. Moreover, both are immanent relations within God—they are God himself, inasmuch as God is Personal. These two processions are called “immanent” and differ radically from creation, in which God acts outside of himself. The processions give rise to the distinctions in God, while their immanence accounts for his unity. Thus, the mystery of the triune God cannot be reduced to a unity without distinctions, as though the three Persons were only three masks; or to three beings without perfect unity, as though three distinct “gods” were joined together. 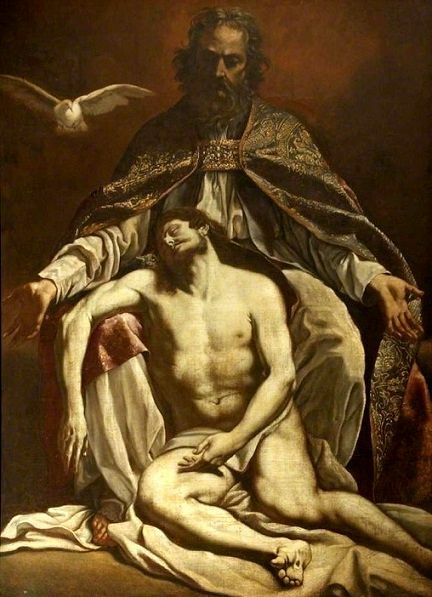 The three Persons are “in one another.” Thus, Jesus tells the Apostle Philip that whoever sees Him sees the Father ( Jn 14:6) inasmuch as He and the Father are one (cf. Jn 10:30, 17:21). This dynamic relationship, technically referred to as pericóresis or circumincession (terms that refer to a movement in which one is linked to another as in a circular dance), helps explain how the mystery of the Triune God is a mystery of Love: “He himself is an eternal communication of love—Father, Son, and Holy Spirit—in whom we are destined to participate” (Catechism, 221). Thus, the ultimate meaning of reality—what all men desire, what philosophers and religions of all times have sought—is the mystery of the Father who eternally engenders the Son in the Love that is the Holy Spirit. It is in the Trinity that the original model of the human family is to be found. God’s intimate life is the true aspiration of all human love. God wants all men and women to form a single family—i.e., to be one with Himself—as his children in the Son. Each human being has been created in the image and likeness of the Trinity (cf. Gen 1:27), and is called to live in communion with all men and women, and above all with the heavenly Father. Here is to be found the ultimate foundation of the value of every person’s life, independently of one’s abilities or achievements. Access to the Father is to be found only in Christ—the Way, the Truth, and the Life (cf. Jn 14:6). Through grace, we come to form a single Mystical Body in the communion of the Church. By contemplating the life of Christ and receiving the Sacraments, we gain access to the intimate life of God. Through Baptism we are inserted into the dynamic of the love of the Family constituted by the three divine Persons. In our daily life, we have the perfect model for our own family life in the Holy Family of Nazareth: “Get to know the three Persons—God the Father, God the Son, God the Holy Spirit. And to reach the Most Blessed Trinity, go through Mary.”  In this way, we learn from the “trinity on earth”—Jesus, Mary, and Joseph—to raise our eyes to the Trinity in heaven. Catechism of the Catholic Church, 232-267. Compendium of the Catechism of the Catholic Church, 44-49. Joseph Cardinal Ratzinger, The God of Jesus Christ: Meditations on the Triune God, Ignatius Press, 1978. “God has left traces of his trinitarian being in creation and in the Old Testament, but the intimacy of his being as a Holy Trinity is a mystery inaccessible to human reason alone and even to the faith of Israel prior to the Incarnation of the Son of God and the sending of the Holy Spirit. This mystery as revealed by Jesus is the source of all the other mysteries” (Compendium , 45). “The Holy Spirit is the third Person of the Most Holy Trinity. He is God, one and equal to the Father and the Son; ‘He proceeds from the Father’ ( Jn 15:26), the beginning without a beginning, the origin of all trinitarian life. He proceeds also from the Son ( Filioque ), through the eternal gift that the Father makes to the Son. The Holy Spirit, sent by the Father and the incarnate Son, guides the Church toward the knowledge of the ‘whole truth’ (Jn 16:13)” (Compendium, 47). “The Church expresses her trinitarian faith by confessing one God in three Persons: Father, Son, and Holy Spirit. The three divine Persons are one God because each of them is identical with the fullness of the one and indivisible divine nature. The three are really distinct from each other through their reciprocal relations: the Father engenders the Son, the Son is engendered by the Father, the Holy Spirit proceeds from the Father and the Son” (Compendium, 48). “Inseparable in their one substance, the divine Persons are also inseparable in their work: the Trinity performs one and the same operation. But in that single divine work, each Person is present according to the mode that is proper to Him in the Trinity” (Compendium , 49). St. Irenaeus, Adversus Haereses, IV, 20, 1. St. Thomas Aquinas, Summa Theologiae, I, q. 43, a. 1, c., a. 2, ad. 3. “The divine ‘We’ constitutes the eternal model of the human ‘we’—above all, that ‘we’ that is formed by man and wife, created in the divine image and likeness.” (John Paul II, Letter to Families, Feb. 2, 1994) 6. St. Josemaría, The Forge, 543. Pope Francis on the Parable of the Prodigal Son. THE TENDERNESS OF OUR LOVING, PATIENT AND MERCIFUL GOD.